Hibs had to come from behind to salvage a point at Dens Park after falling behind for the fourth Premiership match in succession. A Steven Whittaker trip on Roarie Deacon saw Kevin Holt put Dundee ahead from the penalty spot after just nine minutes. But Anthony Stokes levelled things six minutes from the interval, turning Whittaker’s cross past Dundee goalkeeper Scott Bain, who pulled off a string of impressive saves throughout the match to earn Neil McCann’s side their first point of the season. For the fourth match in row, Hibs found themselves trailing and, after the gifts offered to Hamilton last week, it was another present which saw Dundee take the lead in the ninth minute. 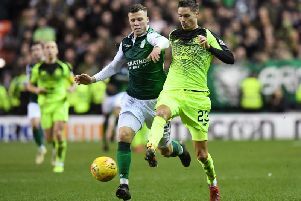 Whittaker, playing at left-back as boss Neil Lennon shuffled his pack, was caught out as Deacon latched onto Glen Kamara’s crossfield ball to cut inside the Hibs defender, who went to ground and tripped him. Although goalkeeper Ofir Marciano guessed the right way, Holt’s low drive from the spot zipped into his bottom left-hand corner. On-loan Manchester City winger Brandon Barker twice tested Dundee goalkeeper Bain as Hibs turned the screw on the home side, the stopper getting down well to turn aside a snap-shot from Simon Murray before Stokes applied the finish to Whittaker’s low cross, his effort taking a touch off defender Kerr Waddell before flying high into the Dundee net for the equaliser. Murray steered one over the bar at the start of the second half before Marvin Bartley broke forward to play a one-two with Stokes as he burst into the Dundee penalty area but Bain did well to smother his shot. A superb ball from John McGinn sent Barker free but, rather than take on a shot early, the youngster, under pressure from the backtracking Holt, could only prod the ball into the arms of Bain, who then pulled off another save to prevent Stokes getting his second of the game. Dundee: Bain, Kerr, Holt, Vincent (Wolters 57), Kamara (O’Hara 82), Allan, McGowan, El Bakhtaoui, Deacon, Hendry, Waddell. Subs not used: Parish, Hateley, Williams, Spence, Piggott. Hibs: Marciano, Gray, McGregor (Ambrose 46), Hanlon, Whittaker, Barker (McGeouch 79)), Bartley, Slivka, McGinn, S Murray (F Murray 76), Stokes. Subs: Laidlaw, Fontaine, Matulevicius, Stevenson.